The annual spring concert is on Wednesday the 27th of March which is an amendment to the original date. The concert starts at 7.30pm in the School Hall and tickets can be purchased on the door at £5 for adults and £3 for concessions. 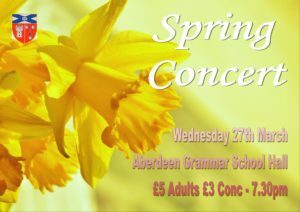 The concert features a large number of pupils from across the school with performances from choirs, bands, and soloists. Definitely not to be missed!